This genus is one of my favorites. Many of its species are charismatic in some way, being excellently camouflaged, or being gaudy in color, or being especially fleet-of-foot. They are also terribly frustrating to photograph largely because of the latter trait. 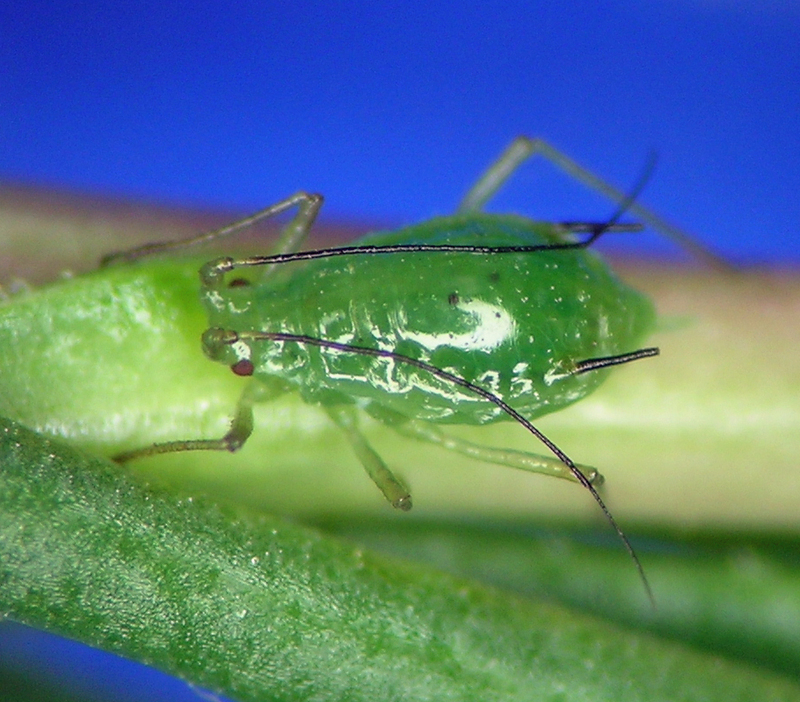 It seems like they, as with most aphids living on desert shrubs, are disturbed as soon as their host plant is jostled and especially once their leaf or sprig is clipped off. Once disturbed they stubbornly refuse to hold still for photos. There are many described species of Pleotrichophorus, and it seems to me that most of the accepted species are valid and recognizable in the field and on slides. The genus lives mostly on Asteraceae, and mostly on shrubs and perennial herbs in xeric habitats such as sagebrush (Artemisia) and rabbitbrush (Chrysothamnus). Pleotrichophorus ex Achillea from Hell’s Canyon, Idaho. The revision of North American Pleotrichophorus by Corpus-Raros and Cook (1974) is really excellent in my opinion, especially considering neither author had done very much collecting in the field. After all my years of collecting this genus, I still find most samples fit fairly well one of the species concepts laid out in their paper. 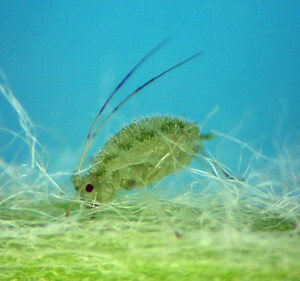 If I had infinite time and money to publish on aphids, I would love to do a complete revisit of their paper, pointing out all the ways they were right, and the few ways I think their work could be improved. One issue with the genus is that some pairs or groups of similar species are recognized from the same host in different geographic areas. 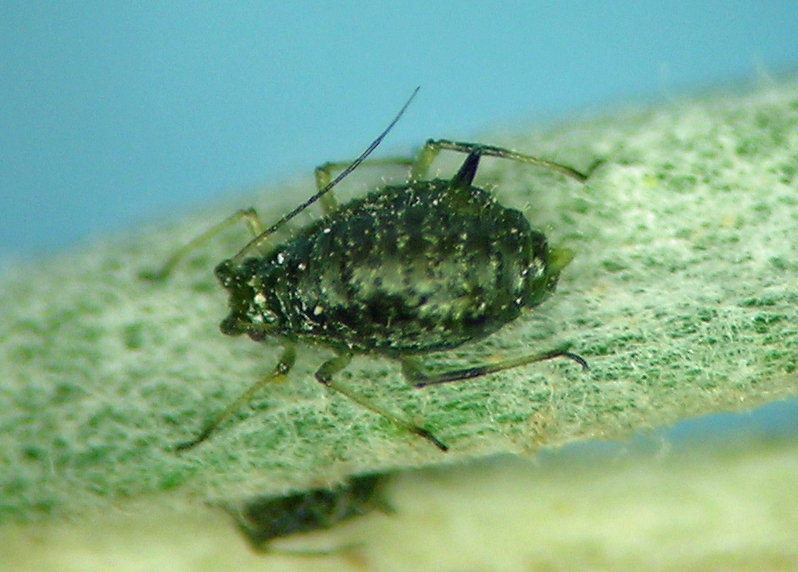 Also, sometimes two species are recognized for very similar aphids that vary in one major character such as length of siphunculi or a particular ratio of body part lengths. Based on my extensive collecting, I think close examination will reveal some of these species names to be applied to local variants of more widely distributed and variable species. An example of this issue are the species found on Achillea across North America. 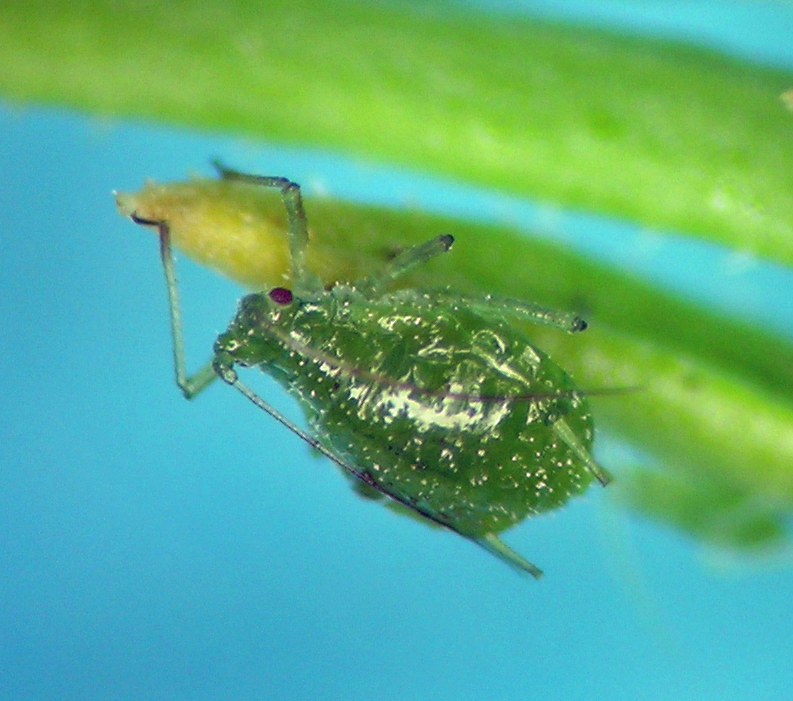 This is an example of a species where my collecting and taxonomy has cast some uncertainty on an aphid’s biology. This species was originally described from Amsinckia intermedia in British Columbia, but since then I have collected it on Phacelia and Eriophyllum. As always with cases like this, it is possible that I misidentified the samples, but the unique morphology of this species is hard to miss. Still, the possibility of undescribed species with unusual morphology similar to P. amsinckii cannot be ignored. 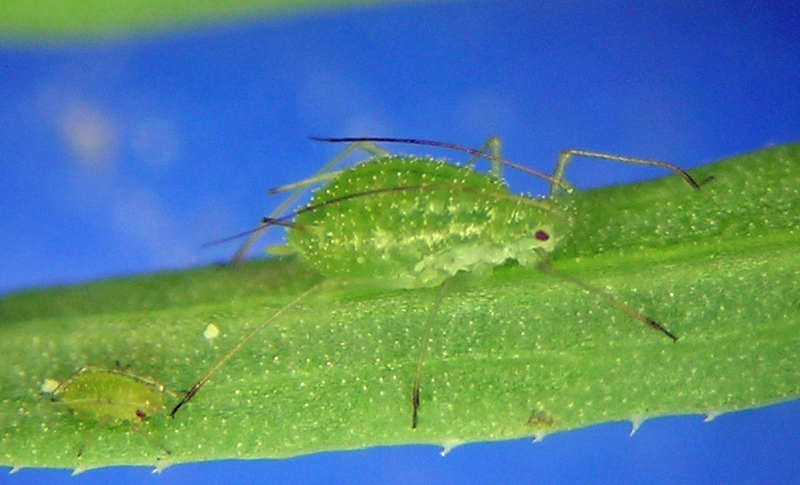 I also have a very similar, possibly undescribed, species from Arizona that was living on a Cirsium in the mountains. My samples of P. amsinckii are all from Washington. Pleotrichophorus amsinckii on Phacelia in central Washington. This is one of the common species of Pleotrichophorus most places I go in western North America. It lives on shrubby Artemisia. If I had learnt my sagebrush taxonomy a long time ago, I could tell you more about what species of sagebrush…. I have samples from Washington, Oregon, Idaho, Nevada, Colorado, Wyoming, and New Mexico. 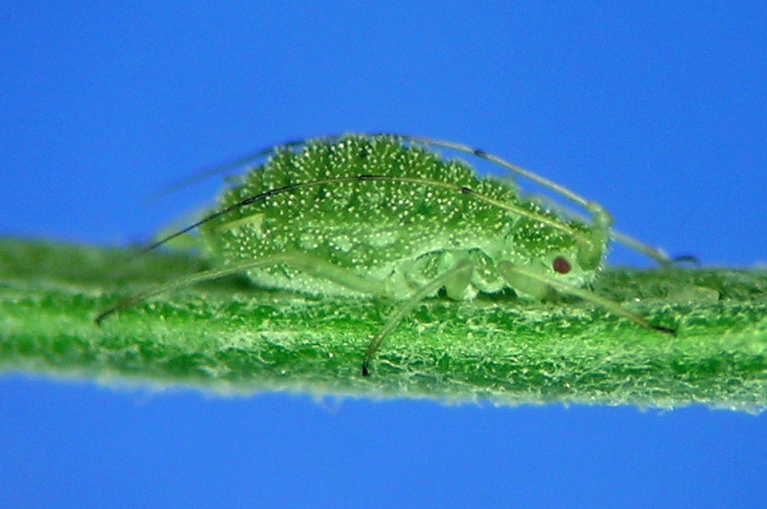 Pleotrichophorus decampus on sagebrush in eastern Oregon in May. One of the most common species of Pleotrichophorus, this one is also easily identified. Living on rabbitbrushes (Chrysothamnus and Ericameria), it is unusual for this genus in having extra setae on the top of the cauda. I have collected it in Washington, Oregon, California, Idaho, Nevada, Utah, Colorado, Wyoming, New Mexico, and Arizona. Pleotrichophorus oestlundi from southern Idaho. Pleotrichophorus oestlundi from southern Idaho, showing a common feature for this genus: relatively dark and prominent veins in the wings. Almost everywhere I see Achillea in the wild, aphids I identify as P. patonkus are present. There is at least one other described species from Achillea in North America, and it is not obviously distinct from P. patonkus. 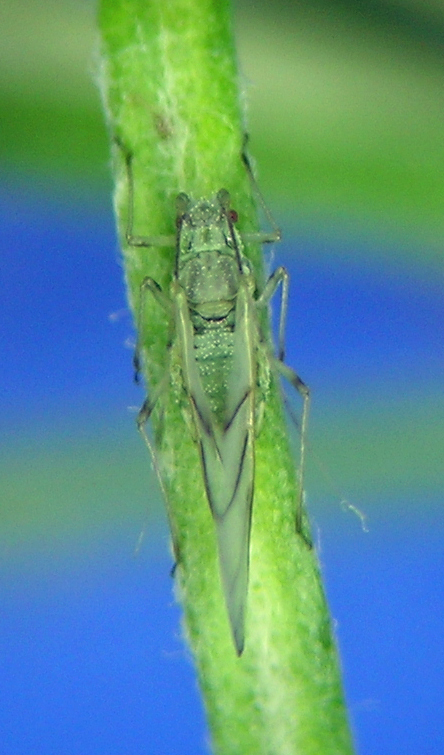 I tend to be a lumper in this case due to the apparent variation in characters thought to distinguish between the two “species.” I have samples of what I call P. patonkus from Washington, Oregon, Idaho, Utah, Colorado, New Mexico, and Quebec, but I have walked by many other possible collections due to the ubiquity of this aphid. As always, failing to collect samples is probably a mistake since it skews our understanding of common species. For example, the common house fly is hardly ever collected due only to its ubiquity. Pleotrichophorus patonkus from the Snake River’s Hells Canyon in April. 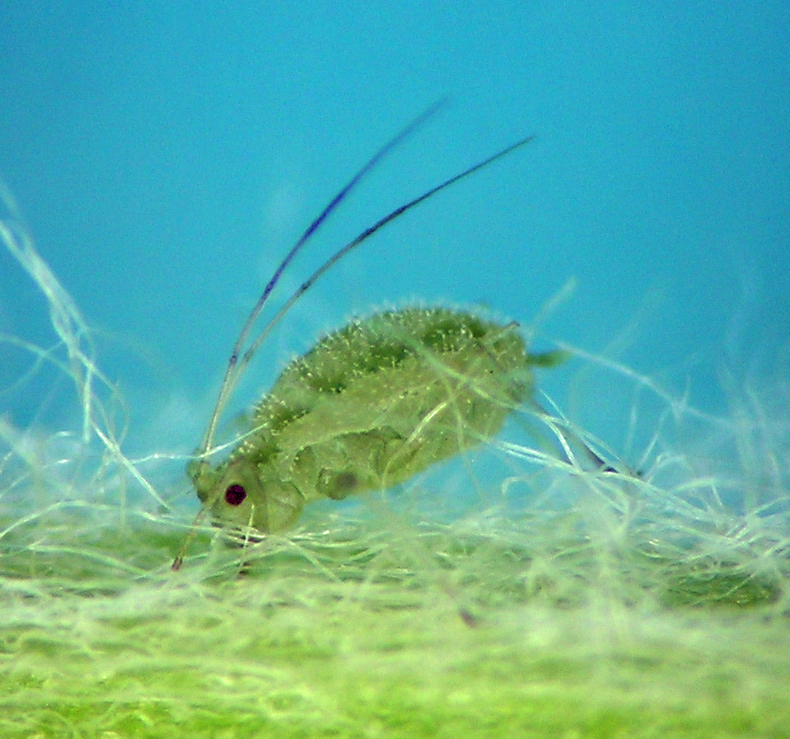 Look at those nymphs embedded in the leaf hairs! This species is relatively easy to recognize due its sparse dorsal setae (sparse for Pleotrichophorus, that is). Most of my samples are from what is known as green rabbitbrush, Chrysothamnus viscidiflorus, and the samples from other rabbitbrushes may well have been in error, vagrants, etc. This is an example of a Pleotrichophorus species that seems to be quite variable in terms of length of siphunculi. I so far have samples from Washington, Oregon, Idaho, Utah, and Nevada . Pleotrichophorus pycnorhysus fundatrix in central Washington living on Chrysothamnus viscidiflorus. 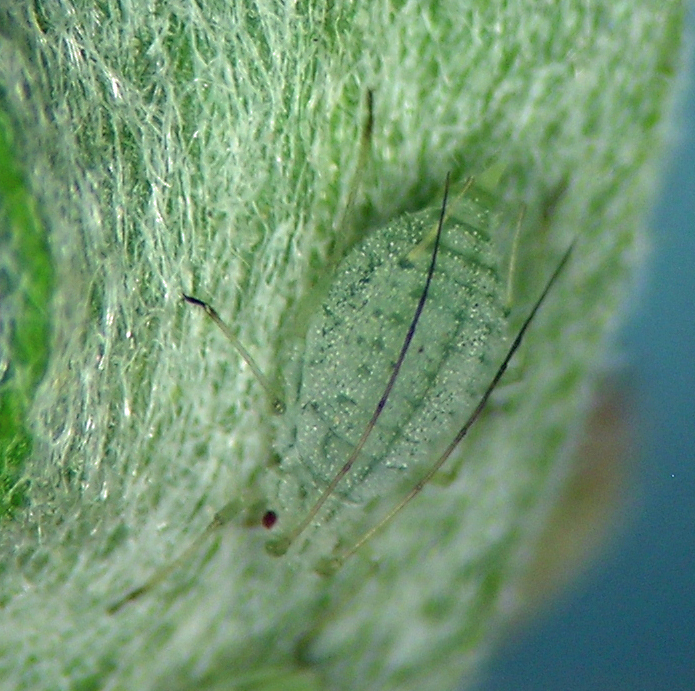 Pleotrichophorus pycnorhysus apterous vivipara from the Boise, Idaho area, once again on green rabbitbrush. This active species is common and wide spread in western North America, and is relatively easy to recognize in part by its dark siphunculi and cauda. It lives on shrubby Artemisia (sagebrush). I have samples from New Mexico north to north-central Washington. Pleotrichophorus quadritrichus from central Washington. 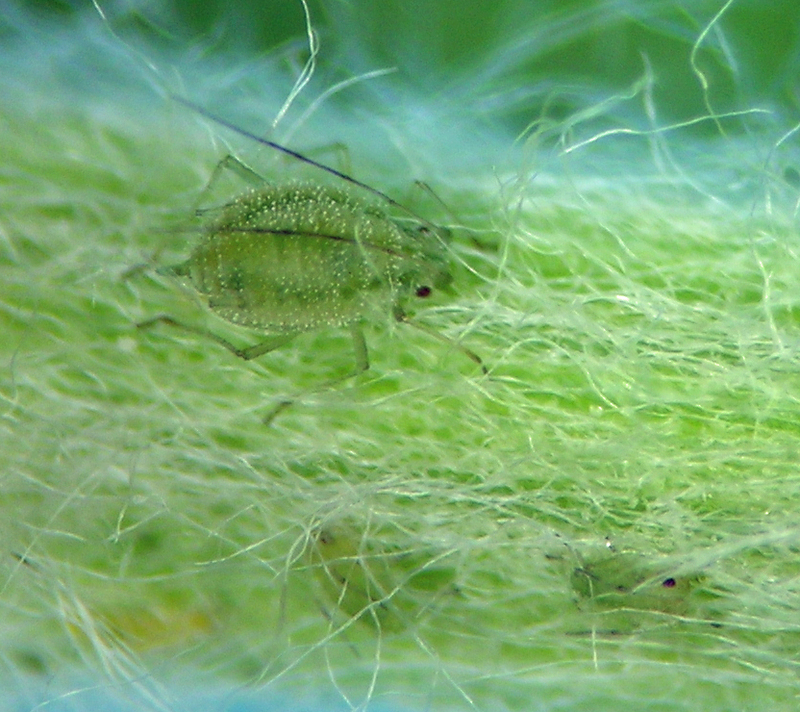 Here is an aphid I sought for so many years that I lost track. From the description, it seemed like it would be an oddball, and sure enough it is, living on its uncommon host, Tetradymia canescens in the sagebrush steppe. Blackman and Eastop’s notes on it seem to imply that they did not believe the color-in-life notes from the literature, but here it is, in its “blackish green” color. 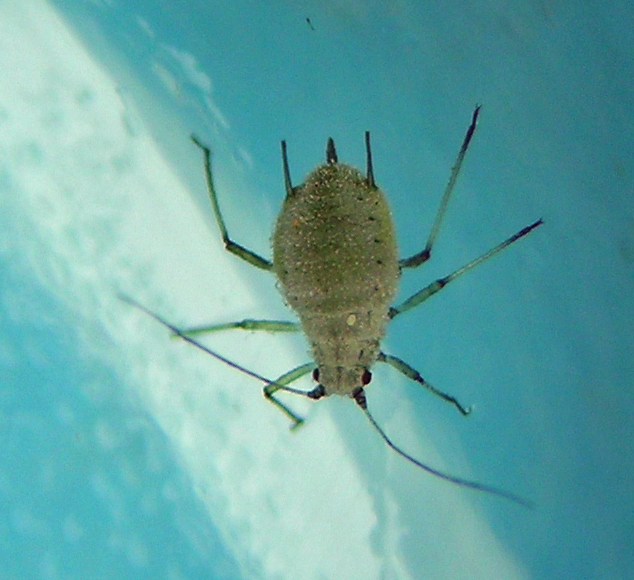 I have only seen this aphid a couple times, in Oregon and Idaho. Pleotrichophorus tetradymiae on Tetradymia canescens near Lakeview, Oregon in September. Rare finds like this species are one of the things that keep me interested in pounding on rabbitbrushes everywhere I go. 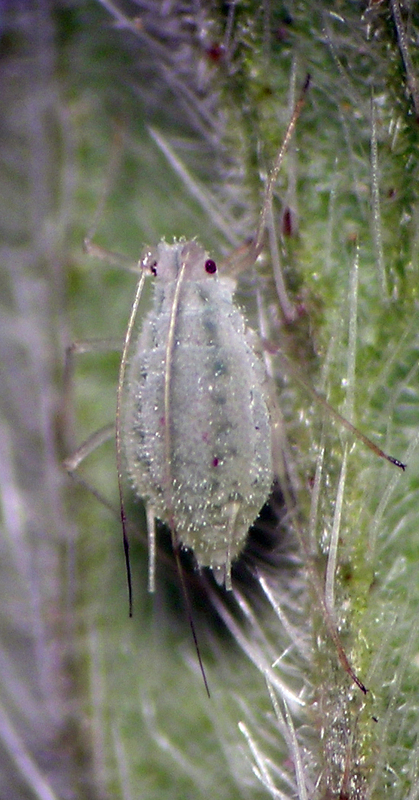 I have seen this species only a few times now in over 25 years of collecting aphids on rabbitbrushes, its hosts. I have samples from Washington, Oregon, and Idaho. Pleotrichophorus utensis, possibly a fundatrix, on green rabbitbrush in southern Idaho in April.